How To Install the Sears Marketplace Integration App? Go to the Sears Marketplace Integration App. 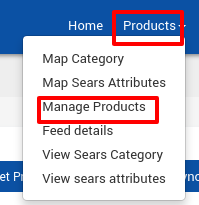 On the top navigation bar, click the Products menu. Click the Update Price button. The products prices are updated on Sears. Note: If there is an error in the product price synchronization process, then it appears on the page. Otherwise, a success message appears with the process status. Click the Back button to go back to the Manage Products page.